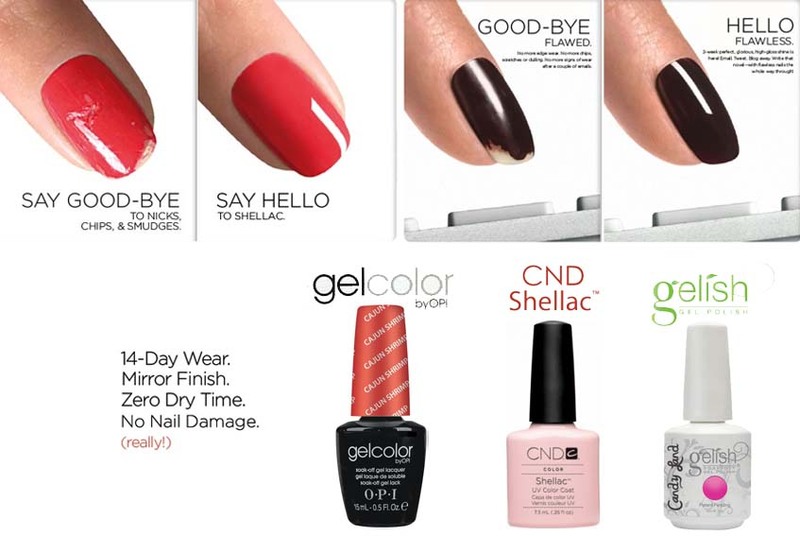 Gel polish has changed a great deal over the last few years. It has become a great way for people who have difficulty with weak or thin fingernails to maintain a manicured look more easily. In addition, because the gel increases the strength and flexibility of the nails, most people find that they are a better option than acrylic tips for jobs where the fingertips are used regularly. One of the advantages of gel polish is that it will maintain the high gloss and color without fading, for 2-4 weeks. It does not chip or peel and will not snap off when you strike the tip of your nail on a keyboard. There are a wide variety of colors to choose from and, unless you are going to wear the polish for a single event or occasion, it is a good idea to choose a color that will generally complement any wardrobe selection. The first application will normally take approximately 30 minutes. This time includes the preparation of the nail beds, which will require buffing in order for the gel to adhere properly to the nail. In most cases a gel base will be applied, followed by 2 coats of gel polish and topped off with a high gloss sealer. After each product application, your hands will be placed under the UV lamp for approximately 30 seconds. As with acrylics, some gel polish can be soaked off with acetone. Newer products are non-porous and must be buffed off by a professional. These products generally will withstand more abuse than the porous gels. However, the “soak-off” gels are more flexible and there are more colors available. Many people find that by using the proper gel polish, their natural nails grow to a length that closely resembles acrylic tips. By staying on the schedule provided by the professional, you will be able to keep your nails looking well-groomed and avoid any issues of peeling or cracking indefinitely.